At the last meeting of Chudleigh Writers’ Group we each selected a headline from a newspaper and wrote a short story bases on the headline. I worked on the above and produced this. ‘Where shall we go next,’ said Ada, as she poured a cup of tea from a white Doulton tea pot.It was one of her favourite’s, it was such an elegant shape enhanced by a thin line of decoration in green and gold. ‘Elsie, that’s brilliant. There’s Selfridges and Fortnum and Mason. 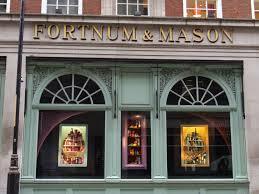 Oh Fortnum’s, one of my favourites. It’s where I met Harold. ‘No, no, he was the lift attendant. We got stuck in the lift. Then he said he’d better make an honest women of me. She wasn’t expecting an answer. ‘Yes do,’ said Ada, sipping from her cup of tea. Tags: Fortnum and Mason, Hotels The Ritz, Selfridges, Tea, Writing Groups.